Your Smartphone may connect you with your friends and family, but spending time with loved ones is a whole different thing which gives you great pleasure. 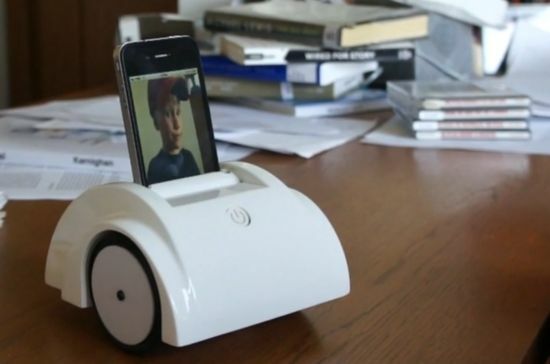 Addressing the issue, designer Tian Long Wang has come up with an innovative device that turns your iPhone into a telepresence robot, changing the way you interact and make your presence felt. Hailed as “Helios,” the telepresence device strengthening your relationships with your family, friends and colleagues; no matter how far you have been staying from them. The Helios is easy to use. All you need to do is unwrap the Helios, and install and open an iOS app on your device to place it within the Helios and turn the device on. Plus, you need a browser and Internet connection to control the Helios with a remote control. All the browsing and transmission of signals is managed through either a 3G/4G network or Wi-Fi.